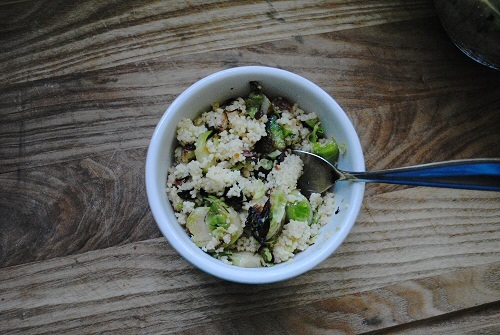 I’ve never given a hoot about couscous, and for a really long time I thought brussel sprouts were the absolute worst. The reason I felt this way was mainly because I had never tried them, and when I finally stopped acting like a child and pulled on my big-girl pants and tried them… Well, I had been wasting so much good eating time. Such a fool. First you want to put on the appropriate amount of water to boil for the couscous, whatever the box says. When it’s boiling you put in the couscous and flavoring, put a lid of in and set it aside off the hot burner. 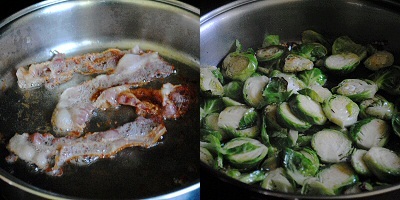 Then you want to put the bacon in a pan to fry up while you are washing and cutting the brussel sprouts. I kept the pan at about medium heat through the whole thing. 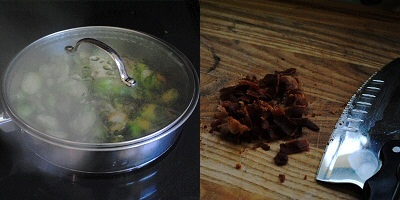 I put in the tbsp of oil with the bacon because you use the oil after you take the bacon out to cool. After cutting off the ends and yucky leaves from the sprouts you want to quarter them. It makes some of the little leaves fall off, but it’ll be great I promise. After flipping the bacon once and burning myself badly by flinging oil on my hand/wrist, I took the bacon out and let it cool on a few paper towels. 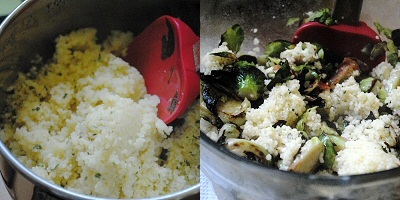 I put my garlic in the garlic press thing and added it to the oil, then threw in my brussel sprouts and tossed them in the pan. Make sure a lot of them are able to lie flat on the pan, they get a great sear from the bacon-grease-oil. 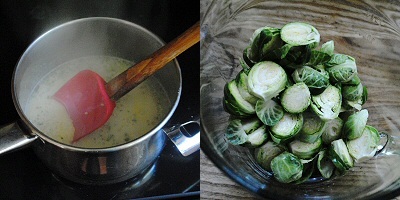 After letting the sprouts saute for about a solid minute, mix the sprouts up and let them saute again on the other side. You want them to get nice and browned on at least one side. Then you add the 2 tbsp of water and put a lid on it for 2 minutes. 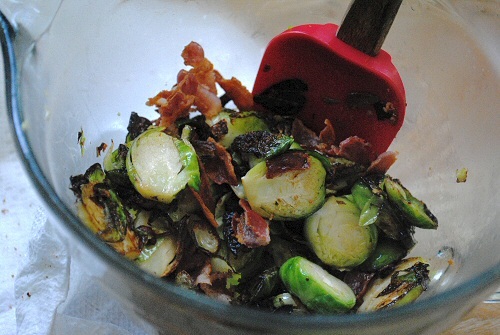 This lets the sprouts steam up a little without losing the flavor. During that 2 minutes chop up the bacon real quick. 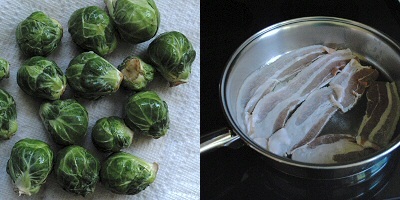 Take the sprouts and the bacon and mix them up in a bowl. Try not to eat too much of the bacon. 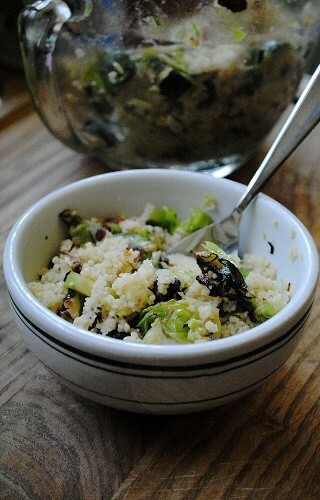 Fluff up the couscous a little bit and then add it to the sprouts and bacon. Mix it, mix it real good, and there you have it! I love making this and then having it for lunch at work for a few days. It’s light enough not to make me need a nap but substantial enough to keep me full for a while. And it’s really yummy!